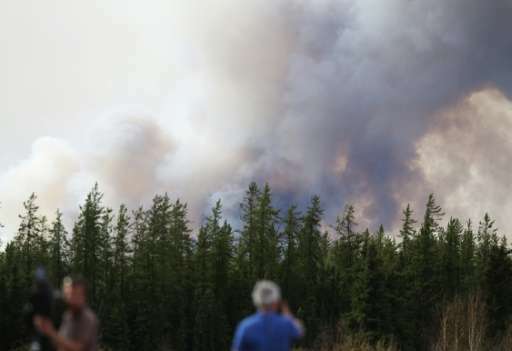 Experts say climate change is contributing to the wildfires raging across Canada, and the increasing frequency of such fires may overwhelm one of Earth's most important ecosystems, the boreal forest. 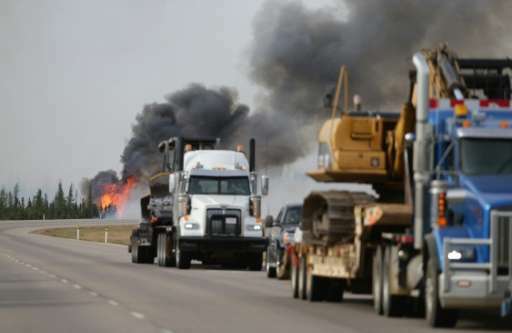 In just over a week, an out of control blaze has charred more than 2,290 square kilometers (884 square miles) of land and forced the evacuation of 100,000 people from Fort McMurray in Alberta, Canada. Dominated by conifers like pine and spruce, the boreal forest sweeps across Canada, Russia, Alaska and Scandinavia making up about 30 percent of the world's forest cover, and absorbing a big chunk of carbon from the atmosphere. As crucial as the boreal forest is at reducing the impact of human-driven fossil fuel emissions, it is also increasingly fragile, and expected to become hotter, drier, and more prone to fires in the future. "Western Canada, including in particular the region in Alberta containing Fort McMurray, has warmed quite a bit more than the global average," said scientist Michael Mann, author of "Dire Predictions: Understanding Climate Change." With the Arctic region warming twice as fast as the rest of the planet, climate model projections place central and western Canada in the "bullseye of enhanced warming," he told AFP. On the heels of the two hottest years in modern history, this warming has meant record low Arctic sea ice this spring. 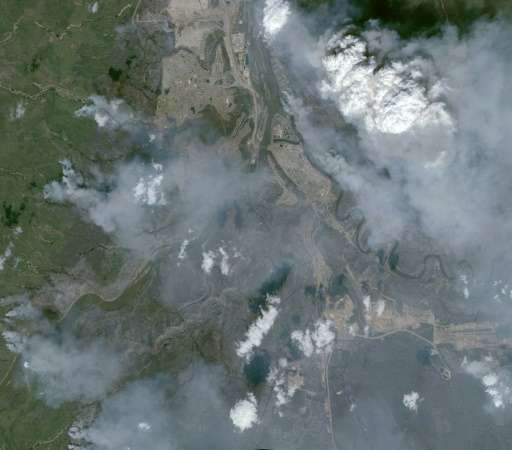 "There is almost certainly a connection between the exceedingly warm Arctic, especially so this past winter, and the early fire season in high-latitude land areas, which includes much of Canada," said Jennifer Francis, research professor at Rutgers University. "When the sea ice is diminished in winter, the contrast in temperature between the open water and cold air means that much more heat and moisture than normal will be transferred from the ocean to the atmosphere. This will warm the atmosphere, and help melt the snow cover." Not only was there less snow than usual, but it melted early this year, added David Martell, professor in the faculty of forestry at the University of Toronto. "The early snow melt primed the system for a particularly challenging spring fire season in Alberta because there is a short but very critical period between the time the snow melts and there is dry dead grass, leaves and needles left from the previous year that constitutes a very flammable fuel mix until green-up, the new lush moist annual vegetation emerges," he said. A growing body of research has pointed to increasing fire activity and longer fire seasons, said Martell. "Those changes are consistent with what climatologists and fire weather people predict will happen under climate change," he told AFP. "But we always have to keep in mind that these are statistical associations, not causal models." More work is needed to determine which fire patterns have changed, and how much of that change can be blamed on global warming, he said. 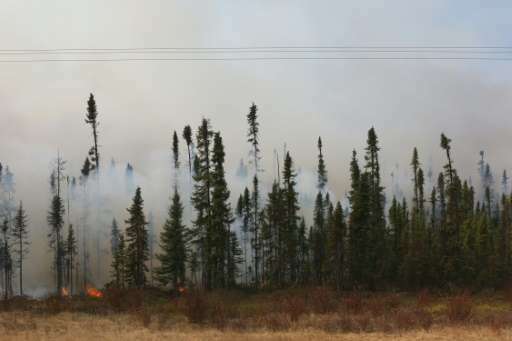 Researchers are also carefully watching how more frequent fires may disrupt the boreal forest's natural ability to rebound. Already, this forest is well adapted to wildfires, which have typically burned every 85 to 500 years, according to Sylvie Gauthier, a research scientist in fire ecology with Natural Resources Canada. "Some species have cones that will only open after a fire, which means the tree will not produce seedlings or young without the presence of a fire," she said. If forests burn more often, trees may not have time to mature and produce seeds in time for the next blaze. "We don't know the impact of such a phenomenon if it happens on a large scale." Not only does the boreal forest absorb about as much carbon as the world's tropical forests, it contributes about 33 percent of the world's lumber and 25 percent of the paper on the export market, she said. Spruce is highly valued by those who cut down trees for economic gain, but nature may have other ways in mind of recovering from a blaze. Namely, researchers have found that trees with falling leaves—deciduous trees such as aspen and birch—tend to sprout more often where conifers have died from blazes. And these deciduous trees are less prone to burning. "In Alaska, they already have evidence that aspen has started taking over spruce after very severe fires," said Martin Girardin, a research scientist with the Canadian Forest Service. "They anticipate that with climate change that eventually the spruce could be replaced, not entirely, but there could be more hardwoods or more aspen because of the rapid succession of fires," he said. "For the industry it is a loss of harvestable volume but if you have a reduction in the loss by fire, maybe it is a good deal. We don't know that yet."